Over the past few months we have worked on regularly updating our irregular leadership change models and forecasts in order to provide monthly 6-month ahead forecasts of the probability of irregular leadership change in a large number of countries–but excluding the US–worldwide. Part of that effort has been the occasional glance back at our previous predictions, and particularly more in-depth examinations for notable cases that we missed or got right, to see whether we can improve our modeling as a result. This note is one of these glances back: a postmortem of our Yemen predictions for the first half of 2015. To provide some background, the ILC forecasts are generated from an ensemble of seven thematic1 split-population duration models. For more details on how this works or what irregular leadership changes are and how we code them, take a look at our R&P paper or this longer arXiv writeup. There is some good news for those who want to believe in “good coups.” A number of military interventions in Africa have led to competitive multiparty elections, creating a necessary condition for successful democratization. These cases include the often (perhaps too often)-cited Malian coup of 1991, the Lesotho coup of 1991, the Nigerien coups of 1999 and 2000, the Guinean coup of 2008, the Malian coup of 2012 and potentially Burkina Faso’s 2014 coup, among others. Here is a quick look at the larger picture. 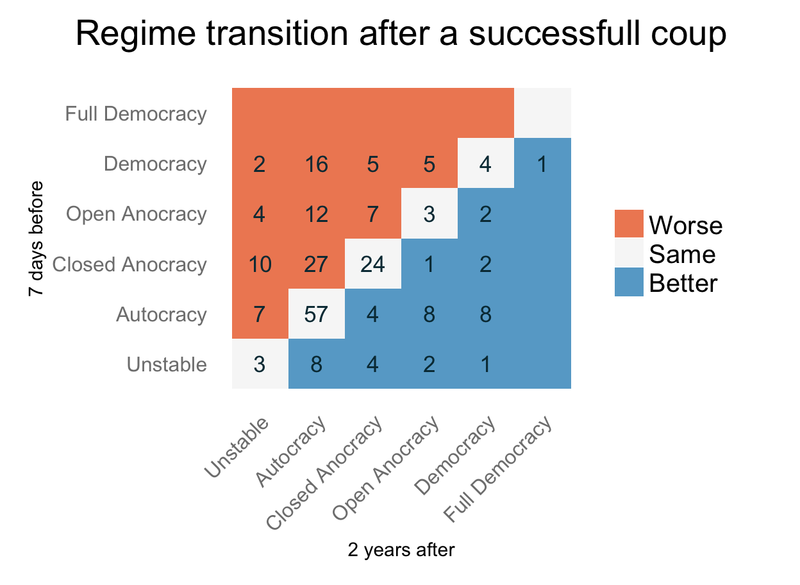 I took the same Powell and Thyne data on coups that is referenced in the blog posts and added the Polity data on regimes to it.1 Specifically, I added the Polity score 7 days before a coup, and 1 and 2 years afterwards, although I’ll focus on the changes 2 years later. The Polity score measures, on a scale from -10 to 10, how autocratic or democratic a regime is. The scale is in turn based on a larger number of items coded by the Polity project. It’s not quite an ordinal or interval scale, in part because there are a couple of special codes for regimes that are in transition or where a country is occupied or without a national government (failed state). Rather than exclude these special scores or convert them to Polity scores, I grouped the Polity scores into several broader categories from autocracy to full democracy, and kept the special codes under the label “unstable”, which may or may not be a good description for them. This post was written by Jay Ulfelder and originally appeared on Dart-Throwing Chimp. The work it describes is part of the NSF-funded MADCOW project to automate the coding of common political science datasets. Guess what? Text mining isn’t push-button, data-making magic, either. As Phil Schrodt likes to say, there is no Data Fairy. I’m quickly learning this point from my first real foray into text mining. Under a grant from the National Science Foundation, I’m working with Phil Schrodt and Mike Ward to use these techniques to develop new measures of several things, including national political regime type. I wish I could say that I’m doing the programming for this task, but I’m not there yet. For the regime-data project, the heavy lifting is being done by Shahryar Minhas, a sharp and able Ph.D. student in political science at Duke University, where Mike leads the WardLab. Shahryar and I are scheduled to present preliminary results from this project at the upcoming Annual Meeting of the American Political Science Association in Washington, DC (see here for details). When we started work on the project, I imagined a relatively simple and mostly automatic process running from location and ingestion of the relevant texts to data extraction, model training, and, finally, data production. Now that we’re actually doing it, though, I’m finding that, as always, the devil is in the details. Here are just a few of the difficulties and decision points we’ve had to confront so far. 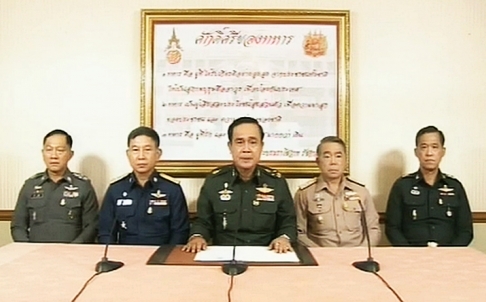 This morning (May 22nd, 2014, East Coast time), the Thai military staged a coup against the caretaker government that had been in power for the past several weeks, after months of protests and political turmoil directed at the government of Yingluck Shinawatra, who herself had been ordered to resign on 7 May by the judiciary. This follows a military coup in 2006, and more than a dozen successful or attempted coups before then. We predicted this event last month, in a report commissioned by the CIA-funded Political Instability Task Force (which we can’t quite share yet). In the report, we forecast irregular regime changes, which include coups but also successful protest campaigns and armed rebellions, for 168 countries around the world for the 6-month period from April to September 2014. Thailand was number 4 on our list, shown below alongside our top 20 forecasts. It was number 10 on Jay Ulfelder’s 2014 coup forecasts. So much for our inability to forecast (very rare) political events, and the irrelevance of what we do. GDELT (gdelt.utdallas.edu) is a global database of events which have been coded from vast quantities of publicly available text that is produced by the world’s new media. It has created a great deal of excitement in the social science community, especially within the field of international relations. But it has had wider visibility as well: in August 2013, there were 150,000 views of a map of protest activity around the world, based on the GDELT database. Event data have been around for several decades, but the GDELT project has generated new interest. ICEWS is an early warning system designed to help US policy analysts predict a variety of international crises to which the US might have to respond. These include international and domestic crises, ethnic and religious violence, as well as rebellion and insurgency. This project was created at the Defense Advanced Research Projects Agency, but has since been funded (through 2013) by the Office of Naval Research. ICEWS also produces a rich corpus of text which is analyzed with powerful techniques of automated event-data production. Since GDELT and ICEWS are based on similar, though not identical methods and sources, it is interesting to compare them. One area in which they are most conceptually different is that ICEWS follows a more traditional approach to event data in seeking to encode a chronology of events that reflects in some sense the putative ground truth of what occurred. The figure on the right shows the corpus of stories in ICEWS (gray) and the resulting events (black): total events are fairly stable over time event though the number of media stories increases. GDELT is more concerned with getting a comprehensive catalogue of all media stories (and other text) on reported events, and the corpus of those media stories is increasing exponentially, as the figure below shows. As a result, the number of events in GDELT is also increasing over time, much more so than ICEWS.